Experiencing hair loss is never a good thing. Hair loss can result to low self-confidence and self-esteem. Because hair is our crowning glory, it’s the first thing people will notice about us. We receive compliments for our healthy tresses, which makes us feel good. Conversely, a person suffering from baldness or thinning hair may feel rejected and inadequate. So it is imperative that we take care of our hair. It is also equally important to choose the best product to do the job. The first step to help improve the hair’s condition and make people look younger is to embrace wellness. That’s according to beauty and wellness expert Ms. Cory Quirino. Cory says choosing wellness as a lifestyle includes eating nutritious food, exercising, getting a good sleep, drinking generous amounts of water, managing stress, getting enough sunshine, and above all, staying positive. A supplement is also necessary to have healthy hair and scalp. While many people opt to use chemical-based products, Cory uses only natural products to care for her hair. She believes this is the best solution for hair loss. Natural ingredients like virgin coconut oil (VCO) and aloe vera help boost the health of the scalp and hair. These and much more natural herbs and essential oils can be found in NOVUHAIR, a topical scalp lotion with 19 natural ingredients that work in synergy to help prevent hair loss, which the beauty and wellness expert approves of. Apart from being effective, Novuhair is a very safe solution, too. A local clinical study has proven that NOVUHAIR has no adverse side effects with continuous use. 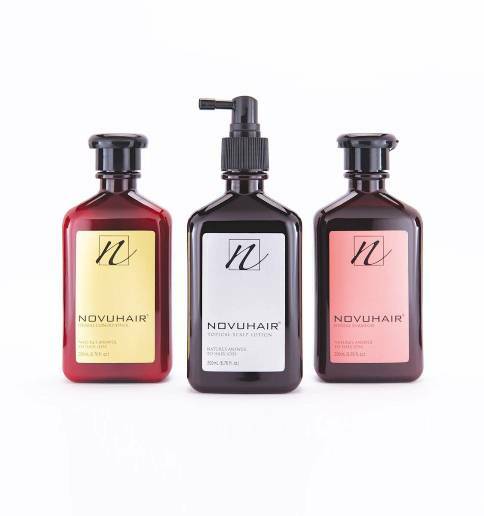 NOVUHAIR is also not just for those who experience hair loss. Younger people, especially the millennials, can also use it for maintenance or prevention if hair loss runs in the family. Cory recommends world-class natural remedy NOVUHAIR to everyone, especially to those who want to maintain their hair the best way they can. For her, this globally-competitive natural product answers the needs of a discriminating, health-conscious public. NOVUHAIR is available at Mercury Drug and other leading drugstores nationwide. You may also have the product delivered right at your doorstep through Lazada at https://bit.ly/2Jc92Vk. This entry was posted in #choosenatural, #ichoosenatural, #naturalwoman, #novuhair, Cory Quirino, Hair Loss, Natural Hair Remedy, Novuhair, Novuhair Herbal Shampoo, Novuhair Topical Scalp Lotion, Press Release. Bookmark the permalink. ← Cartoon Network Stickers Are Now on Viber!